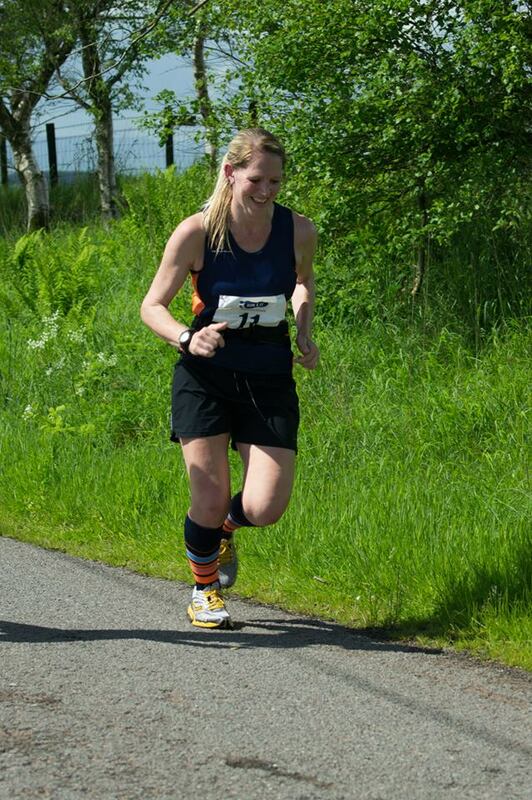 When Jemma signed up for this race last year, I was at the stage where I thought I’d never be able to run a marathon. I was just about comfortable with half marathons and I had just joined my running club with the main aim being to build my confidence in running and improve my speed over shorter distances. Fast forward a year and many, many, many miles later (including a marathon and an ultra marathon!) 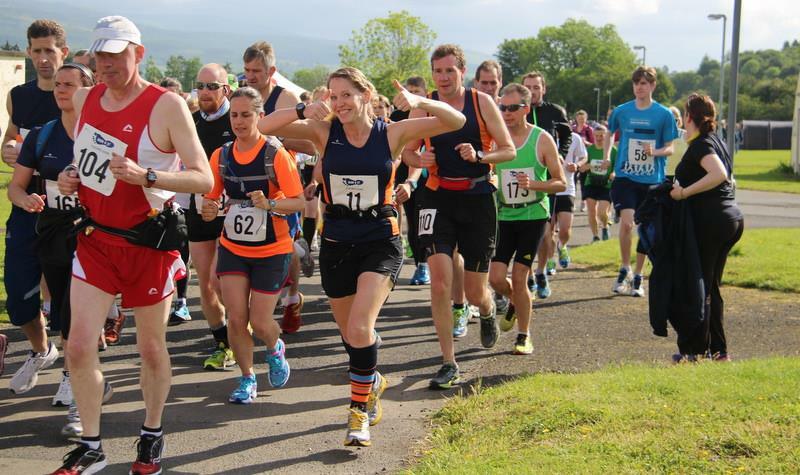 and I was signing up for the Strathearn marathon without a second thought. 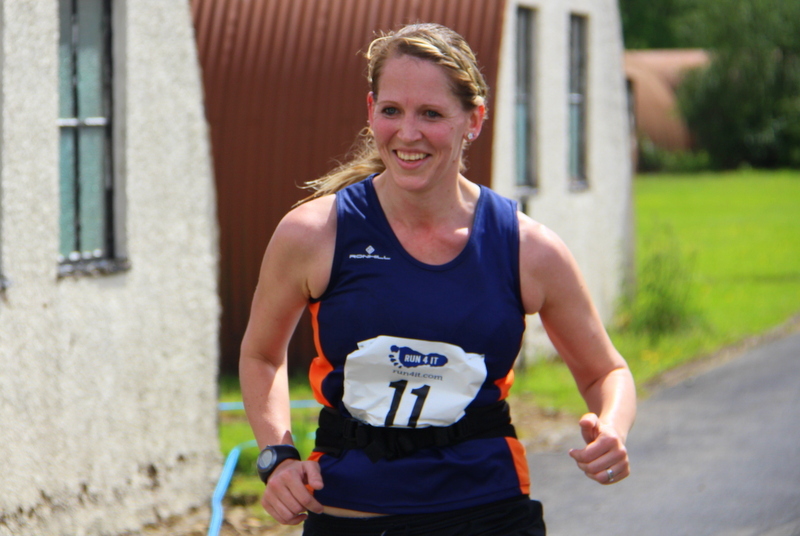 After having to pull out of the Lochaber marathon in April I was keen to make this my big race of the year. 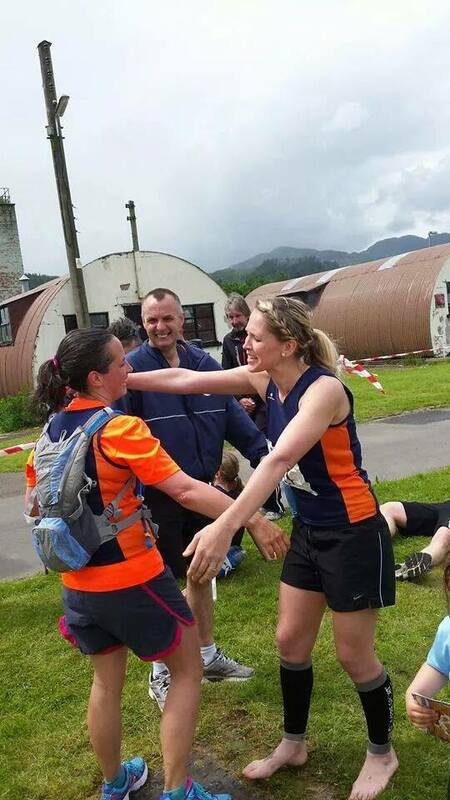 My plan wasn’t to race it but more to get out and run it comfortably and get through without the pain and fatigue I’d felt at Loch Ness last September. If I got a good time then it’d be a bonus, but being able to drive home afterwards was my main goal!! 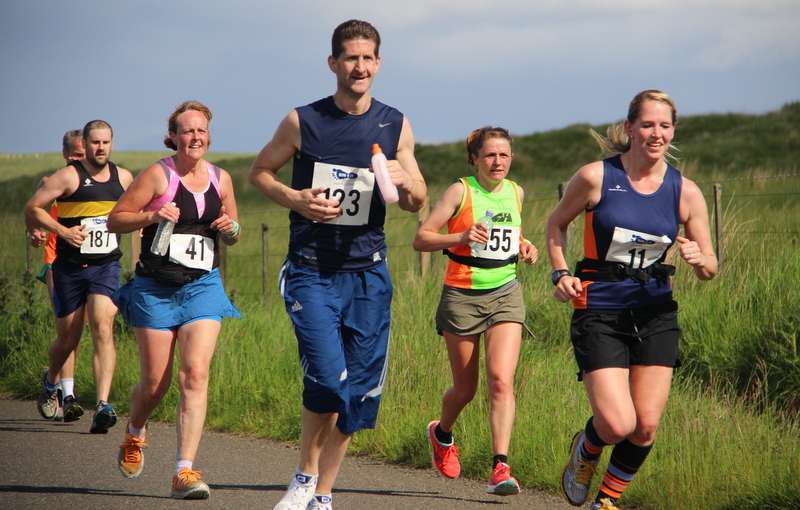 The race begins at Cultybraggan camp which was first used as a prisoner of war camp during World War 2 and then later as an army training area. These days it’s owned by the Comrie Development trust and is used for a variety of projects. We met up with our team mates, registered and plodded about saying hello to various people for the next half an hour. At about 8:20am we decided to get in the toilet queue and then make our last-minute preparations for the race. I’d read on the race brief email that there was a tap available on the campsite but no one seemed to know where it was and then spent a stressful few minutes panicking I had no water and trying to find one! I eventually found it, got my bottles sorted and then bumped into Rachel who had signed up just a few days before and was using it as her last long training run before a big race in a few weeks time. By this point the sun had really come out and I cursed myself for lending my husband Craig my sunglasses to take away on his bands tour with him! We all gathered for a quick race briefing just before 9am and then with a count down from 3, the 190 or so runners were off on our 26.2 miles journey around this beautiful part of the country. First off was a lap of the campsite and then it was out onto a minor road for the first 4 miles of the race. And they were pretty much all up hill – superb! You don’t join the Wee County Harriers to run on flat surfaces I can tell you and straight away I could feel that my training was going to pay off. This was by no means and easy course! I settled into a comfortable pace and enjoyed the scenic landscape as I plodded on up the first set of hills. About 5 miles in the road evened out a bit and then from 7 miles there was a lovely gentle downhill section that lasted a few miles. At 10 and bit miles there was the first of the personalised water bottle stations and having guzzled most of what I had on me already, I swapped the bottle I had on me for another one full of tasty electrolyte water. We took a sharp turn out onto the main road for just over a mile and then in the distance I could see our next obstacle – the old Roman road. The term ‘steep’ would be an understatement, I couldn’t see the top of it! I slowed my pace right down and power walked up remembering how I had run up hills early on at Loch Ness last year and majorly regretted it about 20 miles in. I wasn’t going to make the same mistake again and as it was only getting hotter and hotter I could see things getting messy further on in the race if I didn’t take things easy now. By now I was really looking forward to the next water station so I could grab a bottle of plain water. Mainly to tip over my head but also so I could wash the taste of electrolyte water away. Note to self – the tropical one was not something I looked forward to drinking. I’ll stick to summer fruits in the future! The miles ticked by and I was feeling pretty fresh – slowing right down on the up hill sections and taking my time on the down hills so as not to ruin my quads. The rain came on at around 17 miles and it was a welcome and refreshing change however it didn’t seem to know which way it was falling and came down in all directions. Makes running exciting I can tell you! We came into Crieff just after the 18 mile mark and ahead was the second of the two personalised water bottle stations. I was glad to pick up another bottle with a different flavour in it and I drank hungrily from it. Coming out of Crieff we were met with yet another hill but this one had Stewart from the Wee County Harriers on it who was cheering us round, catching us at various stages of the course and taking pictures of our deteriorating performance! There was no way I was walking this one and kept the momentum going, powering straight to the top. By now my feet were starting to hurt and I had a slight pain between my shoulder blades but it was more annoying than sore. I was this far into the race and things were feeling pretty good, what was going on?! I glanced at my watch for the first time in miles. I knew that sub 4 was well out of the picture but coming along the last road I noticed my watch had just ticked over 4 hours!! I pushed through, back into the camp and onto the finishers straight to hear my name being called over the tannoy and my club mates cheering me on. I grinned and blasted over the finish line in just over 4 hours and 4 minutes. That’s just over 12 minutes off my personal best – how did that happen? I collapsed on the grass and tried to stop my legs from shaking and once I’d recovered I went to congratulate all my friends and cheer everyone else in. First smile for miles. Clock watching with glee! This marathon was wonderful and I’ll definitely be back next year for another shot. The organisation, marshals, volunteers, set up, setting….. it was all perfect.I much prefer this type of race to the bigger commercial ones and with it being so close, I just can’t refuse. My only regret is that I didn’t put sun screen on my face. Rocking the tomato look at work today got a few giggles from the kids! 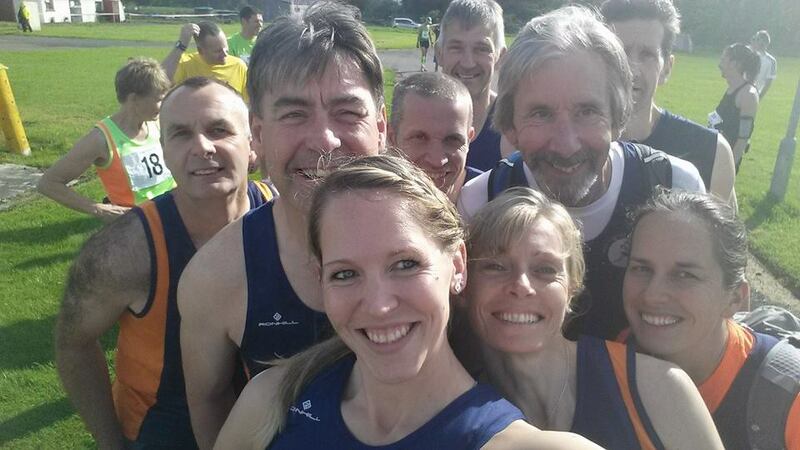 Bring on the sub 4…. Post run celebration with Catriona.